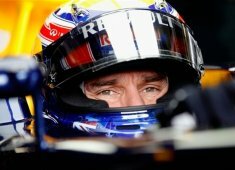 Mark Webber topped the first practice session in Silverstone today. He set a 1:46.603 on a wet Silverstone track that saw many drivers get into difficulties. Webber came to a halt along the track with an undisclosed problem, late in the session. Some drivers at times chose to go out on dry weather tyres, including some testing a new experimental medium compound by Pirelli. It wasn't however the fastest option as all better times were set on intermediates. The only real crash came from Kamui Kobayashi who crashed his Sauber C30 heavily on the exit to Club.